Sometimes, when I’m co-teaching, I feel like my fellow teachers and I can read each other’s minds. There are times when one of my co-teachers and I actually say the same word or phrase simultaneously. Our students find it amusing. As a team, we provide consistent, yet creative instruction, often offering each other a welcome perspective shift or a different way of approaching a subject that makes it more engaging and accessible to all of our students. We learn from each other, and model what that looks like. We provide a safe space where one of us can address a problem with an individual student, while the other carries on with the instructional goals of the day. We can offer each other reflective insights into students we might not know well, or ask our co-teacher to take over when we feel we’re not able to help a student through a rough moment. This magic takes time and effort to conjure, but it is so worth it! This past fall, a few of my colleagues and I presented on a panel that shares a title with this post at the 2017 NNETESOL Conference on November 4th.. We were three ELL teachers, Bill Clark, Kristin Van Fossen, and myself, and one classroom teacher, Nancy Johnson, representing the K-12 spectrum. The room was packed and people were so intrigued they were sitting on the floor and pouring out the door. It is clear that other educators are eager to implement co-teaching, probably because they can see the inherent benefit of teamwork in a often challenging career in teaching. While much of the research on co-teaching was born out of the movement for inclusion of special education students in the mainstream classroom, it is apparent from multiple studies that co-taught classrooms provide positive outcomes for all students and teachers involved. Clark shared, “students in co-taught classes have reported they enjoy school more, have increased motivation, learn more, and feel better about themselves and others" (Walsh & Jones, 2004; Walther-Thomas, Bryant, & Land, 1996). Who wouldn’t want this for their students? Bill Clark, High School ELL, Kristin Van Fossen, 4-5 ELL Teacher, Nancy Johnson, 1st Grade Teacher, and Me, K-1 ELL at the NNETESOL Conference, November 4, 2017. 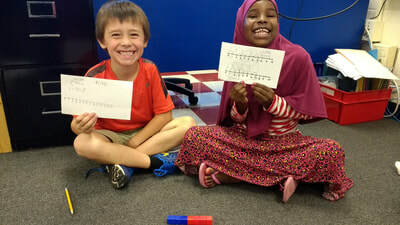 In Winooski, at the K-1 level, I co-teach math. 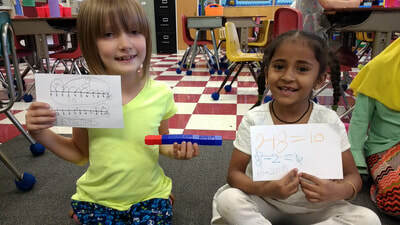 At other grade levels, ELL teachers co-teach both math, literacy, and other subjects. This pairing allows us to gain content knowledge and instructional skills from a classroom teacher, while sharing our own expertise in language development and academic vocabulary acquisition. We still maintain small group pull-out sessions, outside the general ed classroom, to help ELLs develop language that supports their success in the classroom. This is especially essential for students at the newcomer and beginning stages of proficiency, because it allows them a space to have repeated encounters with scaffolded language and a risk-free zone for testing out their new skills. While I can see the incredible benefits of co-teaching, I do feel there is a lot of value in this small group model when paired with increased opportunities for collaboration between classroom and ELL teachers and curricular overlap. Integration of home languages (e.g. 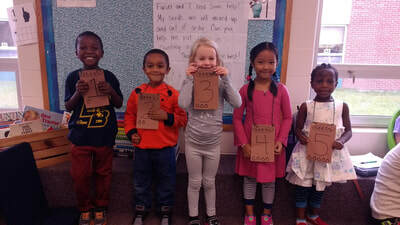 teacher introduction of counting to 10 in a represented language). As a new teacher coming into my school, the best advice I can offer in terms of building a relationship with the classroom teacher is to listen intently, ask lots of meaningful questions, be helpful (offer to do some of the materials prep, etc. ), be consistent with classroom management, take risks at offering up ideas for improvements or changes, don’t be discouraged when you make mistakes, laugh, and don’t be afraid to interact with the class as a whole. If you are lucky, you will work in a district that has built in shared planning time, but oftentimes planning happens before or after school. I join in on whole grade level team meetings when I can, because it allows me to share accommodations for ELLs with the other teachers that they may not have thought of. It is important to note the differences between traditional push-in models of ELL instruction and effective co-teaching models. As one of my colleagues, Kristin Van Fossen, pointed out in our presentation, the only real overlap is that they both happen in the mainstream classroom. While at times a co-teaching model may have small groups that resemble push-in, the key difference is in the status of the teacher and the students. Van Fossen explained it well when she noted that in a push-in scenario teachers are often “competing” for students’ attention, and an the ELL teacher and students can end up feeling isolated from the general instruction. It might feel like the ELL teacher is more of a support teacher than a general ed teacher. Co-teaching, on the other hand, awards equal status to both teachers and students. Both teachers are responsible for all students, and both contribute to curriculum review, planning and instruction. The old proverb that two heads are better than one has been proven true again and again in my work as a co-teacher. Seek out someone who wants to try, take the time to make it work, and I feel confident that your teaching career will be more fulfilling and your students better served. Honigsfeld, A. & Dove, M. (2010). Collaboration and Co-Teaching: Strategies for English Learners. Corwin. Ponce, J. (2017) “The Far Reaching Benefits of Co-Teaching for ELLs.” Retrieved from https://www.teachingchannel.org/blog/2017/01/20/benefits-of-co-teaching-for-ells/. Walsh, J. M., & Snyder, D. (1993). Cooperative Teaching: An Effective Model for All Students. Case in Point. VIII (2), 20 - 22. Walsh, J. & Jones, B. (2004). New Models of Collaborative Teaching. Teaching Exceptional Children. Vol. 36, No. 5, 14 -20. Walther-Thomas, C., Bryant, M., & Land, S. (1996). Planning for Effective Co-Teaching The Key to Successful Inclusion: The Key to Successful Inclusion. Remedial and Special Education, 17(4), 255-264. Walther-Thomas, C.S. (1997). Co-teaching experiences: The benefits and problems that teachers and principals report over time. Journal of Learning Disabilities, 30(4), 395-407. Vaughn, S., Gersten, R., & Chard, D. J. (2000). The underlying message in LD intervention research: Findings from research syntheses. Exceptional children, 67(1), 99-114. PBL in ELL Pull-Out? Yes, it's possible! I have long been a proponent of project-based learning (PBL), but have struggled to incorporate it in my limited time with my students in ELL pullout groups. PBL involves framing learning within units of study that build skills and knowledge to be put to use in solving a real world problem or creating an authentic product that is shared with a public audience. The work is collaborative, student-centered, reflective, and often perceived as time consuming. I only have students for 25 to 30 minutes a day or even on alternate days, which hardly seemed like enough time to carry out a high-quality project. However, after delving deeper in PBL professional development that was offered to us as a teaching staff through 2 Revolutions, I was able to wrap my head around what it might look like, and to carry out a successful project with my first grade ELLs in just 25 minutes at the end of the day! After going through this process, I'm confident I can do PBL with more of my classes. I'm also convinced that like with most classroom practices and techniques, the more you do it, the easier it becomes. 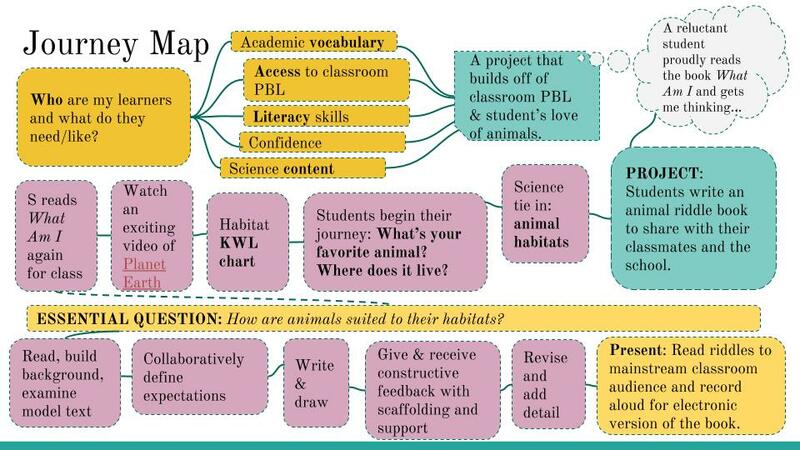 To learn more about high-quality PBL in ELL, read on or, check out the journey map below that outlines the process I used to create my pilot project. It’s spring! At this time of year, I like to do a unit on fruits and vegetables, gardens and making soup with my kindergarteners that works with a garden project they do in their classrooms. It coincides perfectly with our Empty Bowls event, a fundraiser and community dinner. This year, with my newcomers, we started by looking at fruits and vegetables, naming them, sorting them based on colors, and listening for initial sounds. We played fruits and vegetables Bingo, and “Hot Potato,” passing plastic veggies around the room until the music stopped and the student holding the toy had to tell what it was and it’s color. We read a few different books about making soup, to practice reading sight words and to set the context. These included Growing Vegetable Soup by Lois Ehlert, Community Soup by Alma Fullerton, and the Fountas & Pinnell leveled reader Making Soup. We practiced making soup with playdough, forming different vegetables we wanted in our soup and cutting them up and putting them in color pots. Finally, we started our real soup prep, my students helped me peel the carrots and sweet potatoes, chop the vegetables with plastic knives, and press garlic and ginger. We used the recipe at the back of Community Soup as our guide. We smelled the different spices and herbs that would season our soup: cinnamon, parsley and basil. The students scrunched their noses at the garlic and ginger, but once we had it all simmering in the pot they couldn’t wait to try it. They took turns adding handfuls of veggies to the warm pot, then pouring in the broth, and stirring. After our soup cooked for a while, I blended it all with a hand blender and we poured in coconut milk. This creamy, flavorful soup was one of the best I’ve ever tasted, especially since it was made by our classroom community. The students who wanted to try it took a bit home in a coffee cup, but the rest was donated to the Empty Bowls dinner, and at parent teacher conferences beforehand I encouraged my students’ families to come and enjoy the soup their children had made. This week, we're putting pictures of this process in order and creating a classroom book on how to make soup. They are helping to tell what we did and write the text. Then, we'll read it together and students can make their own books to read and share with their classmates. The kindergarten classes are also doing a project where students must create a "how to" book and so this work supports success in their mainstream classrooms. Another first for me, I attended the 25th Annual VT Kindergarten Conference. Like the Diversity Conference I attended last week, it was also at the Hilton Hotel and was a day of inspiration. The theme of the conference was “The Arts as a Tool for Learning: Nurturing the Imagination in Children” and the workshops I attended stayed true to that theme. The great thing about this whole day, is even though it wasn’t specifically geared towards English language learners, everything discussed had value for making instruction more accessible and engaging for ELLs. As participants, we also got to get our creative juices flowing by looking at a popular student text and brainstorming ways the story could be brought to life through the arts. Our group chose The Snowy Day by Ezra Jack Keats. We thought you could also easily incorporate a large piece of white fabric or a white sheet that could become the snow covering everything, and the snow falling on Peter’s head when he whacks a stick on a snowy tree. We also thought about using shaving cream on a table or salt trays for students to create the different tracks like Peter does in the story. Acting the story out in real snow would absolutely be the best, but without real snow acting out in the classroom can also be fun (I’ve done this.) Another idea was to also use white clay to make track imprints or little snowmen. A mixed media collage combining different textured papers to layer a scene like the colorful scenes in the book could also be fun. What if you had students use paint or something that reacts to water and melt some real snow or an ice cube on the collage to see how it changes with the melting snow, as the snow melted in Peter’s pocket when he tried to save it for later? Once you get started, the ideas just start flowing. Earlier this week, I attended my first Diversity Conference, hosted by the Greater Burlington Area Multicultural Resource Center at the Hilton in downtown Burlington. It was an inspiring, reflective, and emotional day. The uncertainty of the current political climate was palpable, but so were hope, honesty and love. The morning began with a presentation by Dr. Jonathan Jansen of South Africa. Dr. Jansen, a Stanford graduate who grew up under the Apartheid, is well known for his work with the University of the Free State, setting the bar for integration and anti-discrimination practices. His connection to Vermont stems from a program in which he sent South African students around the U.S. to colleges and universities where they mingled with peers to better understand and improve race relations. His presentation centered around his work with interracial relationships, both friendships and romantic relationships, and how people who are part of such relationships challenge social mores that continue to reinforce social and systemic segregation. Following the keynote, there was a panel on Diversity in Education, which included Moise St. Louis, Saint Michael’s College Associate Dean of Students and Director of Center for Multicultural Affairs & Services, Dr. Lacretia Flash, Office of Human Resources, Diversity and Multicultural Affairs at UVM, Miguel Fernandez, Chief Diversity Officer at Middlebury College, author and entrepreneur Wally Amos, “Famous Amos”, and Ame Lambert, the Chief Diversity Officer at Champlain College. Each was eloquently spoken and had powerful messages to deliver. Mr. St. Louis urged the audience to consider our educational future, asking what sort of educational institutions we hope for and how we can shape them so that our children are better than us at breaking down racial prejudices. Dr. Lacretia Flash read her essay “The Gift of Troubled Times,” written for the Peace and Justice Center, and cited the United State’s downgraded status on the Democracy Index from “full democracy” to “flawed democracy” as an indicator of our troubled times. She theorized that our challenge stems from a disconnect between our national values and ideals, arguing that our values are defined by individuality, competition, and success tied to winning (economically or otherwise), whereas our ideals, which we often hold up as representative of our democracy, are justice, equality and community. Recently, my first graders went on a school scavenger hunt. I have frequently used this activity as a newcomer orientation to the school and it’s always met with great enthusiasm. Students feel very official wandering the halls with their clipboards in hand and pencils ready to check off the boxes of the places they see. This year, we first read Pete the Cat: Rocking in My School Shoes to introduce school places. All the first graders love Pete the Cat and we also use I Love My White Shoes to learn color words. In the book, there are clues that hint at which location Pete will visit and students have to guess where he is going next. This was a perfect connection to the scavenger hunt. In my mixed proficiency level newcomer group, this was an activity that was easy to differentiate. I had some students who were able to focus on the phrase and sentence level clues, while others relied on the pictures and the key vocabulary of school places to begin learning the names of places they visit everyday. I created a checklist with pictures of different rooms around school, and students had to use books and labeled flashcards to match words and pictures, then label their own check-lists. We also printed and read the book The School from Reading A-Z. After students had finished their writing, we set off about the school. I gave them clues about where we would head next: “Where do we see books on every wall?” or “Oh, I have a stomach ache and a headache, where should I go?” We roamed the school until all of our places were checked off. ​Another newcomer activity, an interactive song that I made to the tune "The Wheels on the Bus", also helps children become acquainted with school places and expectations. I find that learners latch on to this song early, and we end up singing it all through the year. New verses can be added to introduce new language or to personalise. 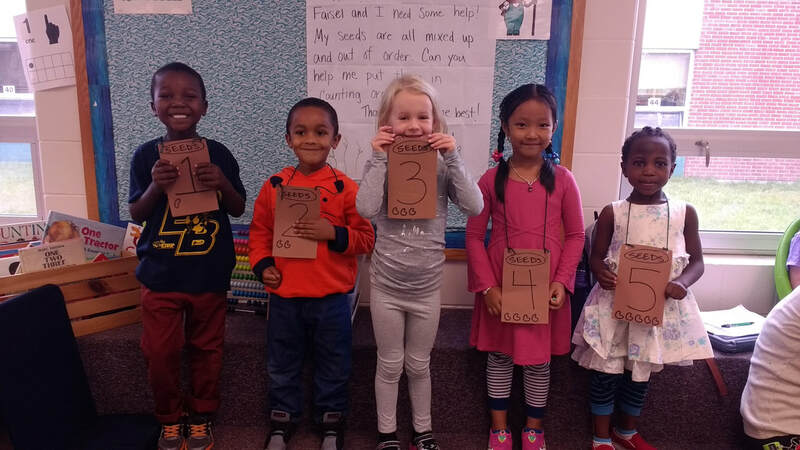 For example, kindergarten classes are doing a project-based learning unit on community and friendship, with a focus on students writing books for incoming students on how to navigate kindergarten. To supplement this discussion, we’ve also been talking about friendship activities and vocabulary in ELL. We added a new verse to our song this week about playing and sharing with friends. For the few years I have been teaching ELL at JFK in Winooski, Vermont, co-teaching with two grade level teachers during math has been one of the most rewarding experiences of my educational career. Learning to teach side-by-side with a classroom teacher, while gaining new content skills and sharing my own expertise of how ELLs develop language, has benefited all the children in our classrooms. Our co-teaching is most effective when we’ve had time to plan together, set our common goals, discuss differentiation, and divide materials creation tasks. Recently hearing an improv comedian on VPR’s Fresh Air, Chris Gethard, explain how working closely with another comedian over time and with lots of practice gave root to an almost telepathic relationship where you could predict what the other person would say way before they said it, I was struck by how true that can be of a co-teacher relationship as well. At least one in which co-planning is a precursor to co-teaching. However, with our busy weekly planning, meeting with math and literacy coaches, special educators, student support and faculty meetings, etc. it can often be a challenge to find common planning time. While my co-teachers and I can quickly get on the same page before a lesson, touch base about student progress after a lesson, and be flexible during a lesson when one of us has an idea for pushing students thinking or dialing it back to reach all learners, there is no substitute for formal shared planning. The use of Google Docs for lesson development has created a virtual space where time becomes less of a barrier to successful co-teaching. In first grade, the team plans math when I’m unable to attend, but my co-teacher is able to plug lessons into a shared online plan that I have access to. This way, if we don’t have time to meet, I can at least know what is happening each day and add to the plan with accommodations, ideas to adapt lessons for my ELLs, and strategies for accessing key vocabulary. I may also ask questions that my co-teacher can then read and respond to right in the shared plan. When we do have a chance to sit down together, we continue to use this tool, both on our own computers, so that we can jot down changes and ideas as we talk about them and refer back to them before a lesson. The form we use also allows us to highlight math habits of interaction and habits of mind that we want to focus on in each lesson. The top of the lesson plan asks us to identify the big idea in the form of a question. Even if we have only this clarified, we are on our way to more cohesive instruction. This shared lesson planning has fostered an equitable and transparent co-teaching relationship. At the kindergarten level, my co-teacher and I have begun to move our unique, thematic and play-based units in math onto Google Docs where we can quickly paste links to videos, printables and public records we want to share with the rest of the kindergarten team. When we return to these plans next year, all of our materials and ideas will be in one convenient place. Apps like CamScanner are a great way to get hand written materials into an electronic format for later reference and use. With this app, you can take a picture of a poster, for example, and upload it to Google Drive as a PDF file. This file can then be inserted in the Google Doc lesson plan. In addition, after my co-teacher and I both attended the NNETESOL conference in November, we returned with another idea for our shared lesson planning inspired by Katy Heermann’s presentation “Bridging the Divide - Increasing Collaboration Between Classroom and ELL Teachers” to add a table with “can do” descriptors at different WIDA proficiency standards that is tailored to the content of each unit (NNETESOL 2016). I’ve begun adding these to the kindergarten math units, and plan to add them to the first grade units as well. This can act as a guide for other classroom teachers as they are thinking about how their ELLs can participate and contribute to math lessons. The online lesson planning has been so successful that both of my co-teachers are now using it not only for math, but also to help pass information to me regarding literacy units and meetings I’m unable to attend. If you haven’t yet started using Google Docs, it might be time to take the plunge. This blog post was originally published on the on June 6, 2016. 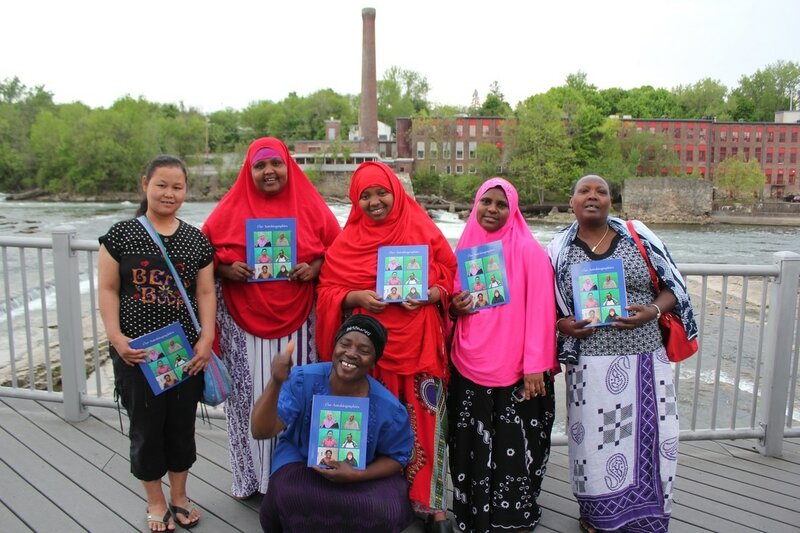 This year, the Winooski School District family English classes took on a new project. Women in their third year of after school English classes explored the world of biography with the goal of writing their own autobiographies. ELL teachers and classroom teachers teamed up to create a year-long curriculum using processes of project-based learning (PBL). The fall semester was spent reading biographies on historical figures. Books were found through the school libraries and provided reading material for students at different levels. Students participated in a combination of shared read alouds, independent reading and choral reading. Characteristics and features of biographies were identified and discussed, such as sequential life events written in a timeline, or a central message to a person’s life story. The teachers used elements of responsive classroom, a greeting meeting and team building activity, to create a sense of community in the class and introduce elements that scaffolded biography work. For example, when discussing how stories often share memories linked to emotions, students might have played “feeling” charades to preview vocabulary and assess understanding. As stories were read in class, students were encouraged to make connections with text and extend their learning through speaking and writing. In the second semester, the focus was on students creating their own autobiographies. The literacy levels of the class varied, so much of the preparatory work was oral. As students were asked to tell or write memories from different times in their life, the women found similarities between their tales. Each story showed emotion: sadness, joy, and laughter were all present as students creatively put all of their English vocabulary to use to convey their meaning. All students made incredible effort to put their words on paper, and then these were typed up into formal autobiographical texts. Teachers asked questions to make writing more detailed and encouraged verbal recounting and peer sharing. In the end, work was published into a book and each student chose one memory to tell for a movie. A public showcase celebrated their hard work. The women graciously agreed to put their book up for sale in order to help the district raise more money for future family literacy work. If you are interested in supporting this cause, please follow this link. For a curriculum guide and template, which was presented at the NNETESOL Conference in 2016, click here. Tomorrow, the kids come back. Last night, I climbed a wall, all the way to the top. This post is about why I think climbing is a good metaphor for teaching. I haven’t been climbing, and I mean indoor mock rock climbing, for very long, just a handful of times. The first time I did it, I was petrified of moving beyond jumping distance of the floor, but gradually, as I got comfortable with the belay system and talked myself through my heart-racing fear of heights, I started to have fun. This experience is not unlike the first time you observe a class you will teach in, or realize someone is going to watch you do a lesson, or even experience that bit of anxiety that still makes you have nightmares before the first day of a new school year. Once you’re past that though, you start to pay attention to the course ahead, and enjoy puzzling out your route. Imagine the wall is a class of students, and it presents various challenges, some of them complex, some of them straightforward. The wall is also within a building of many walls, the school community, or if I ever get outside, a rock face of a bigger mountain (I’m quite comfortable in my building!). The toe holds jutting out from this wall are crucial, and I equate those to all the professional development and training we do as teachers. While there are incredible amounts of research and resources behind these toeholds, and complex systems in place, we just hang on to those key pieces that are going to move us up the wall, towards successful learning with our students. We wouldn’t be climbing if we didn’t use our upper body, our arms and our hands to reach higher and higher with every balanced step. Those reaches are our own creativity, flexibility and patience as we look for that next move towards helping a child make progress. The handholds are the positive learning experiences we achieve with our students, and when we reach them, we are confident, and we are motivated to keep on climbing. Even when our muscles start to burn, and feel like they might give way, and the next hold seems too distant, we know that if we just keep reaching, we’ll make some progress towards the top. At times, we may have to take a break, or at least I know I do, and rely on the support of others. My husband is a fantastic climbing buddy, he tells me to hang back on the rope to look at my route, take a breath, and get right back to it. Just like my colleagues and I at school remind each other to take time for ourselves, to step back from a situation to get clarification, and then keep trying. When we reach the top, when we see a child succeed, it is exhilarating. We can then look back and say, “Wow! That was hard, but we made it.” The next route will be challenging too, and as we attempt higher and higher climbs, we may experience some of that same old fear of heights creeping back in, but when we know the result of our efforts is that fantastic feeling of reaching the top, it is worth overcoming our jitters. Each time we climb, there will be familiar aspects too. Some of those footholds will ring a bell, and we’ll be thankful when we see them. Some of those handholds will remind us of other times when we felt like we were in the “zone,” and we will be delighted that creating that positive learning experience almost seems routine now. In our discussions with other climbers, we will gain new techniques that make our climb more exciting or manageable. We will watch other climbers too, and we will be in awe of their skill, hoping one day to reach their level of calm, flexibility and grace as they swing, jump and pull themselves into harmony with the wall, the challenges of education. 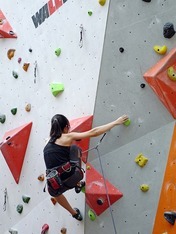 ​I’m thrilled to step onto the wall, both at the gym and at school. Can’t wait for another great year!